The CIO mandate includes security, innovation, productivity, and customer engagement, and the job is only getting harder. For more than a decade, Heller Search has provided IT leaders with advice, case studies, and research on the approaches IT leaders are using to excel in their jobs. From seasoned CIOs to up-and-coming managers, IT leaders turn to Heller Search for guidance in their roles and careers. 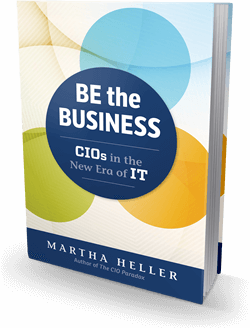 In her trademark journalistic, witty style, Martha Heller discusses the skills required of CIOs who can transform IT leadership in an era when technology belongs to everyone.